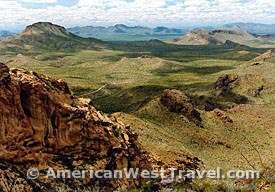 Like most regions of the American west, the Sonoran Desert is broken up by numerous mountain "island" chains. These are small mountains ranges, almost always running north-south, which often rise abruptly out of the desert floor and break up the tedium of the open desert. At Organ Pipe Cactus National Monument, the Ajo Mountains dominate the landscape. The mountains are not tall enough to provide climactic change (highest peak is 4,800 feet) but they do provide a very lush desert landscape at a slightly cooler temperature. They also provide exciting vistas (photos, above left and right). The mountains drain into a network of washes which water the surrounding desert. In the Sonoran desert long outwash plains known as "bajadas" provide the ideal environment for immense saguaro forests. While the saguaro is the most common large cactus, the park's namesake, the strange organ pipe cactus (right), is the featured flora here. While common in Mexico, the organ pipe's presence in the United States is only here at the park. The organ pipe's limbs have a look similar to the saguaro but there is a fascinating difference. Its arms all grow out of the base of the plant while the saguaro's arms grow high off the main stem and only after the plant has lived for many years. Younger saguaros (left) may be immense, weighing many tons, but do not have arms. There are even a few stands of the organ pipe's even more bizarre and rare relative, the senita (right). The wispy, hairy tips on their arms reminded the namers of an "old man" (senita in Spanish). The main difference is that the senita has only four flutes on it arms while the organ pipe has many. The desert environment is very fragile. Slight changes alter the vegetation. Cacti tend to cluster in micro-environments which suit them best. Shown left, the teddy bear chollas are clustered on the lower hillside while the organ pipes are near the top of the hill where it's steeper. Saguaros tend to favor bajadas, large plains which are gernally flat but mildly sloping. Amazing forests of saguaros can be found at Saguaro National Park just outside of Tucson, a 90 minute drive from here. Visitors to the area should also check out the the Arizona-Sonora Desert Museum, one of America's top museums. It offers a great collection of desert flora and fauna in a spectacular outdoor setting. The Museum is adjacent to Saguaro National Park.